Police detectives are continuing their enquiries after a suspected burglar found dead in the loft space of a Queensbury chemist’s shop could have lain undiscovered for several weeks. 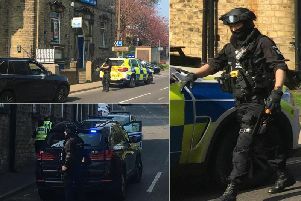 It is thought the man had removed roof files from Rowlands Pharmacy in Queensbury, near Bradford, and was asphyxiated and trapped when his clothing snagged. His body was discovered by staff on Friday. Officers are hoping to formally identify man this week. A spokesperson for West Yorkshire Police said an investigation is underway and enquiries are ongoing. Queensbury councillor Paul Cromie said he was saddened to hear of the news. He said: “For anyone to lose their life in any circumstance is bad. This was bad because of the timescale of it.